A day dedicated to wine and gourmet food at Cantine Duca di Salaparuta. On Sunday, April 29, perfect opportunity for a wine-scented site inspection at Cantine Duca di Salaparuta in Casteldaccia (Palermo, Sicily). The winery opens its cellars for an entire day of wine tastings, paired with local gastronomic delicacies. 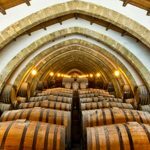 The program (€15 per person) includes a guided tour of the winery, and a tasting of 6 Florio and Duca di Salaparuta wines and 3 Sicilian gastronomy products. For those interested in the guided tour and wine tasting only, the cost is €5 per person. Visiting times: from 11 am until 6 pm. 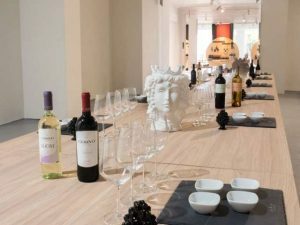 For wine enthusiasts, Cantine Duca di Salaparuta also offers a technical workshop with tastings of the winery’s most renowned wines, as well as a gourmet delicacy. Tickets: €30 per person. Reservation is mandatory. Visiting times: 11:30 am and 3 pm. The historic Cantine Duca di Salaparuta winery in Casteldaccia has 3 meeting rooms for events for up to 150 people. Modern and essential furnishing. The renowned Corvo di Salaparuta wine was created here in 1823.